Update 2: All back to fully operational now, sorry for the inconvenience. Update: I have disabled the forums and authentication integration as well as made some changes to at least bring the main testing online. The forums will be back once Dreamhost fixes the problems with the MySQL server. Sorry, Dreamhost seems to be having all sorts of problems trying to keep the server that runs WebPagetest running so the site has been unavailable for the better part of the day. I've been harassing them on a fairly regular basis so hopefully they will get it cleared up soon. This is the first in what is likely to be a multi-post series discussing how HTTP works down at the TCP packet level, opportunities for improvement and a look at how some of the big players perform. I'm going to assume that if you're reading this you have a fairly good idea of what HTTP and TCP are and what the roles of each are. What I want to focus on is the design goals of each and how those goals impact the web as we know it today. It also does it's best to be kind to the underlying network infrastructure. HTTP is a request/response protocol where there is always a 1:1 mapping between requests from a client and responses from the server (assuming no errors). It is also generally limited to send one request at a time over a given TCP connection and can't send another request until the previous one complete (HTTP pipelining aside which was pretty much a colossal failure). Web pages generally require a bunch of individual requests to load a full page (20-100 is not unusual) but it all starts with a single request for the "base page" which is the HTML code that defines the page and all of the elements required to build it. The web browser (client) doesn't know what other elements it needs to download until the base page loads (at least far enough where it can start identifying elements and parsing the HTML). There are 2 features of TCP in particular that I want to discuss that have a fairly large impact on the performance of HTTP - Nagle and TCP Slow Start. Both are somewhat sensitive to the end-to-end latency between the server and the client so it's probably useful to first understand what some typical latencies look like. I'll generally refer to the end-to-end latency as the Round Trip Time (RTT). There are generally 2 places latency comes into play when we talk about a consumer's connection to your web servers (we're just talking front-end between the user's browser and your servers). These were measured from just a few samples so may not represent global averages or newer technology (the DSL number in particular may be a little high) but is good enough for these discussions. Nagle is a feature that tries to gather outbound data into as few packets as possible and can really help applications that do a bunch of small writes. What it essentially does is send out as many full packets as it can and if it ends up with a partial packet at the end, instead of sending that it will hang onto it for a brief amount of time in case the application is going to send more data. In an extreme case where an application writes out a large amount of data one byte at a time, instead of sending a packet for every single byte it would be able to reduce that significantly (over 1000x) which is better for both the network and the application. It does generally mean that the last bit of data you send is going to get delayed by at least one round-trip's worth of time (it sends a partial frame when all other data transmitted has been ACK'd by the receiver and there is no pending data on the wire). What this means for HTTP is that with Nagle enabled, the end of every response will generally get held up by one RTT. In the case of flushing the partial response out early the end of the data that got flushed would also be held up for one RTT or until more of the response is sent back (potentially killing any benefit from the early flush). If the receiver has delayed ACK's enabled then it's possible for an additional 200ms to get added to the last chunk. Fortunately, Nagle can be turned off on a per-connection basis by setting the TCP_NODELAY option on the socket and the majority of HTTP servers have it disabled. I do know that it is disabled in Apache, Squid and IIS. I'm a little less sure about lighttpd (there was a ticket opened a long time ago to do it but I haven't actually checked). Checking to see if Nagle is disabled is generally pretty easy to see in a packet trace. Generally if you see the PSH bit set it means it has been disabled. TCP Slow Start is the algorithm that TCP uses to probe the network path and determine how much data can be in flight between the server and the client at any given point in time. The client advertises what the upper limit is during the 3-way handshake (receive window) but the server doesn't immediately start by blasting out the full window's worth of data, it ramps up from a very small number of packets and keeps increasing as the client successfully receives data until either the window is fully filled or data starts getting dropped. In 1999, RFC 2581 set the initial number of packets that TCP should use in slow start to 2 which was actually a fairly significant improvement from the 1 that it was before because in concert with delayed ACK's the slow start could actually stall for 200 ms. In 2002, RFC 3390 increased the initial window to roughly 4 KB and as best as I can tell it hasn't changed since then. We all know how well pipelining worked out, don't we? And that's exactly what browsers are doing (and more so as they go from 2 up to 6 concurrent connections). Unlike Nagle, Slow Start can't be tweaked or configured. It is baked into the OS TCP stack. In looking at packet captures from the big players in search where every millisecond matters it looks like they are all seeing a penalty from it. Interestingly Bing seems to be using a window closer to 6-8 KB but I need to take a closer look and see if that's normal for Windows or if they are doing something special. I was somewhat surprised to see that Google who are generally the kings of speed and are already running custom kernels hadn't gone in and tweaked with it at all. Google's main search page looks to fit under the 4 KB window which helps with it's delivery speed but the search results do not (and with some tweaks to slow start you should be able to deliver even bigger pages just about as fast, and certainly faster than they are currently delivered). Interesting, so what can we do about it? Up until now, for the most part this has been an exercise in identifying areas that are impacting our ability to deliver web pages as fast as possible. Instead of having all of the intelligence at the lowest levels of the OS I think it would make a lot of sense to bubble up some of the configurations and statistics up to the applications so they can do on-the-fly tuning. If I get some free time to work on it I'm going to look at building some patches for the Linux kernel that would expose settings for slow start on a per-connection basis as well as statistics around RTT and packet loss (also on a per-connection basis). Then applications could be intelligent and tune the settings dynamically. For example, a web server could start out by setting the initial window to an intelligent guess as to what it should be for optimum performance (complex algorithms could help but say for example, that it starts out at a size that would satisfy 80% of requests based on historical data). If it starts seeing packet loss at a higher than acceptable rate on the aggregate of it's connections it ramps the size down for future connections and every now and then attempts to increase it as packet loss goes away. It basically lets you do a lot of application-specific tuning without having to build a single algorithm that will work for all protocols. At this point it's all mostly theoretical so please feel free to poke giant sticks at it (or me). I'll probably start just by configuring bigger windows statically in the kernel and seeing how that works but for sites or applications looking to squeeze every last bit of performance out of http this looks to be a good way to do it and it can be done without any changes on the client or to the protocols (always a good thing). One of the really important features that WebPagetest offers is the ability to test on various different connection types. This is critical when you're testing the end-user experience because the difference in performance between a fast Ethernet connection to a web site and a consumer connection is HUGE (like orders of magnitude huge). The main differences boil down to bandwidth (how fast your connection is - in each direction) and latency (usually referred to as the "ping times" by gamers). Bandwidth is interesting but for most sites the real killer is latency and consumer connections can easily have 50+ ms of latency before they even get to the Internet. It may not seem like much but when you add it up over tens of requests and the number of round trips each requires the effect adds up really quickly (and is the main reason it is critical to reduce the number of requests for your web site). Most of the commercial services for testing site performance will offer you either backbone-connected test systems or (for significantly more money) testing over actual ISP connections. The backbone-connected testing is reasonably good for trending but tends to be fairly far off of the consumer experience and can easily hide changes in the number of requests or bytes that would have a large impact on the consumer experience and using real resedential lines gets to be very cost prohibitive when you're doing high-volume testing. When we (AOL) built out our internal performance testing systems (to augment the commercial systems we use) we did a bunch of testing and analyzing and decided that a good compromise would be to use traffic-shaping technology to simulate various types of last-mile connections on our high-speed connectivity. This gives us the flexibility to test any type of consumer connection while still keeping costs under control. There are a bunch of options for "simulating" consumer connections (proxies, browser plug-ins, etc) but it was very important to me that if we were going to simulate the connectivity that the simulation be accurate and most of the solutions fail that basic test. Unless the simulation is happening at the packet level you are going to miss a lot of the subtle behaviors that will impact the performance (TCP slow start is a great example). A bunch of them also work by proxying the browser connection which changes how the browser makes it's requests. Of these, dummynet was the one we liked the most. It was designed for protocol testing and could reliably simulate all of the aspects of a connection that we found interesting, was REALLY easy to configure and could scale really well (we can run several hundred test systems behind a single dummynet system, each getting a dedicated virtual pipe). Nist Net was supposed to be accurate as well but hadn't been kept up to date (didn't work with more recent kernels) and was unpleasant to configure. The netem solution is probably the most complex, requiring configuring using HTB or something else to do bandwidth and after using dummynet was excruciating to configure for a large number of systems. This works exceptionally well for large test systems but if you're trying to deploy a small-footprint, the need for the external PC and custom networking causes problems. As we get people offering remote test systems (most recently with Daemon Solutions hosting the UK test location) it is not fair to also ask them to set up the complicated simulation configuration so I started looking around again to see if the landscape had improved any. The first thing that grabbed my attention was that dummynet is now available on Linux. This is pretty exciting to me not so much because of the fact that it's on Linux but because Linux ALSO offers a lot of very good virtualization options (which really don't exist for FreeBSD). This opens up the possibility of having a single physical device contain the traffic shaping as well as one or more test systems (different browser versions for example). Before you say "why don't you just run FreeBSD in a VM", I did a bunch of testing on that a while ago, trying to achieve the same goal, and the timing within a virtual environment isn't reliable enough to do good traffic shaping (it could sort of do it but the consistency just wasn't there). Running a Linux host will let the traffic shaping still happen on a physical host. It does raise the question of how consistent the test data will be for the actual browser running in a VM. I also did a bunch of testing on that (may write about it at some point because the data was not what I expected) and as long as you only use a single VM it is as reliable as a physical machine (more than one VM, even on a really high-end server tuned for it introduced enough variability to steer us away from it). It looks like it does most of what I'd need for a stand-alone system and would work right out of the box. I'm going to do some testing with it but if it pans out we may be able to get consistent connectivity types across the various test locations. One of the particularly useful things you can do is look at your own test results and compare them in the distribution graphs to see where you land. For example, are you slower than 95% of the sites that were tested? How do the number of requests and bytes stack up? How about the optimizations? Load Time: 35% of the sites tool longer than 10 seconds to load (and there's a pretty long tail that goes out to 60 seconds with 5% of the sites taking longer than 30 seconds). On the positive side, 33% of the sites loaded in under 5 seconds. Time to First Byte: Looked surprisingly good with 76% of sites coming in under 500ms. More confirmation that the back-end on most sites works well and the work needs to be done on the front-end (content). That said, 9% took over 2 seconds so there are some sites that still have some back-end work to do. Time to Start Render: There is a lot of room for improvement and this is probably one of the most useful measurements (and unique to Pagetest). The user doesn't see anything display before this point so it doesn't matter how fast the back-end is if there is a lot of js and css code loading in the head that prevents the page from rendering (even worse is not much code but lots of files). 60% of the sites take over 2 seconds to start rendering with 20% of the sites taking over 5. If you're going to focus on optimizing anything, this is the first number you should be looking at. Page Size: I feel sorry for anyone still using dial-up. 30% of the sites were over 500KB. Number of Requests: This is usually the most impactful measurement because most of the time in making a request is wasted and not actually downloading content so the more requests on the page the more time that is being wasted not downloading content. 33% of the sites have 50 or more requests with 12% having 100 or more (with a really scary tail out to 400). Number of Redirects: 66% of the sites had no redirects and in general things looked really good. The 2% of sites with over 8 redirects should probably look at reducing them though. I won't go through all of them but I will hit the high points. Most sites are doing a good job with persistent connections. Only 5% of the sites are not leveraging keep-alives at all. On compression, 50% of the sites could save 50% or more of their text bytes by enabling gzip compression. This helps both the end user and saves bytes on the wire which goes directly to bandwidth costs the site owners have to pay. The biggest impact for most sites comes in combining several js and css files into a singlee file (of each type). This goes directly to the start render time and 20-30% of the sites have a large number of files to combine. There are a ton of charts and a lot more data in the full analysis so if you want more information head over there. I also have an excel spreadsheet of the raw data available at the end of the analysis if you want to run any different kinds of analysis on it. As I look through the tests that come through WebPagetest I've been wondering if all of the optimization checks really make sense or if we should really be focusing on just the top 3 or 4 things that have the largest impact and not worrying about the smaller things. A LOT of the pages I see come through don't even have the basics in place and they may be overwhelmed by the checklists, etc (and by the time you start worrying about a few bytes from cookies, that may not be the real bottleneck for your site and you may be wasting optimization time). This was particularly tweaked as YSlow 2 was released and added more automated checks from the 34 best practices. Are people going to be trying for an A and over-optimizing or optimizing the wrong part of their site? Are people at the beginning of the curve going to be overwhelmed about what they have to do and miss the opportunity for a large payoff for minimal effort? Ryan Doherty wrote a really good article where he did a step-by-step optimization of a fake social network portal in "Optimizing openSpaceBook". He did miss persistent connections and I'd argue that even minifying probably wasn't necessary but he hit the big hitters and documented the improvement from each. I decided to take that framework and walk through optimizing a real-world site going through the steps from easiest to implement to the most difficult and just focusing on the changes that would result in large gains. Enable Persistent Connections: This is a simple configuration setting on most web servers, requires no changes to the site and has almost no risk (the only risk is if you are running a site at close to capacity you may not be able to keep the connections open for long). Allow the Browser to Cache your Static Content: Now we're starting to stray into possibly requiring code changes and this won't have any impact on the initial load time bot for repeat visits the savings can be significant. Reduce the Number of HTTP Requests: This one is a bit more ambiguous but the most important cases for this are to collapse your CSS and JS down to a single file of each and to use image sprites for your page element graphics. 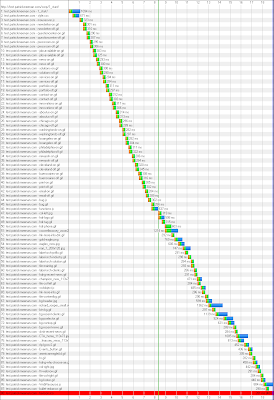 This definitely requires more work than the other 3 optimizations but the payoff is usually well worth it. I decided to take a corporate portal and walk through an optimization exercise much like Ryan did to see what the benefit was for each step. It didn't take long to find one that was in pretty bad shape - I decided to look at a portal for a national web design company and it turns out that their home page pretty much failed everything except for the persistent connections so I cloned their site, broke the persistent connections and started optimizing. 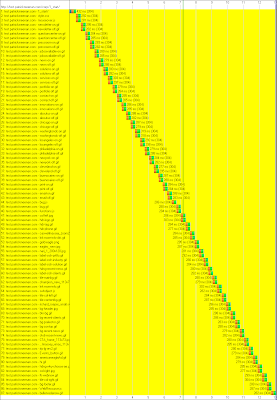 If you ever see one of your repeat view waterfalls with a lot of yellow on it it means you REALLY need to do a better job of letting the browser cache your page. All of those requests are wasted round trips. You'll notice that the repeat view is not much faster than the first view even though it only downloads 20KB of data - that's because of the 87 requests which are really slowing things down. That's close to a 50% improvement in load times with 5 minutes worth of work and NO changes to the page itself. This will not have any impact on the first view performance but if users ever come back to your site it can have a huge impact on the performance of your site. We are starting to cross the line into "may require some application work" though to make sure it is safe for your static assets to be cached for long periods. If so, then actually enabling it is again just a configuration setting on the server. As expected, no impact to the first view times, but the repeat view times got 90% faster. That's another 60% improvement in the first view times (and I only did the easy combining - it could have been refined even more). As you can see, with just 4 core rules you can take a page from 18 seconds to load all the way down to 4 seconds (an 80% improvement). If that doesn't demonstrate the 80/20 rule, I don't know what does. Are the other best practices worth implementing/checking? I'd strongly content that it's good to know them but once you actually implement even these 4 basic rules you're either going to be fast enough or you're going to be doing some more advanced testing and analysis to see what is making the site slow (probably by manually looking at the waterfalls and looking for the bottlenecks). I'm not making any changes yet but I'm strongly considering changing the checklist on WebPagetest to focus on these 4 rules as critical to implement and then provide the other details more as informational checks but not present them as prominently as they currently are.